So much to comment on! I can tell my eyes are not doing so well...I found a cabbage and no bunny! I really had to inspect that 🐇tea pot. Oh my! Those cinnamon rolls look yummy. What a great way to feature the recipe also. 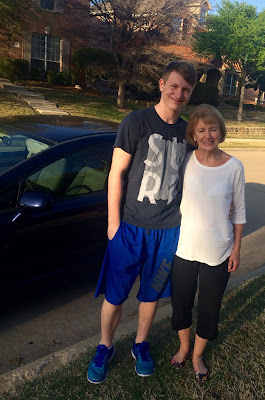 So grandsons grow that tall and learn to drive? He's a good one to take you out for a spin around the neighborhood. Yum- I wish I had a plate of those right now! That bunny also caught my eye- how cute is that! Oh yes, those cinnamon rolls would go great with my cup of tea this morning. It's a blessing when your grandchildren show up for a visit. Love the tulips, I love Spring! Hello Kitty, your cinnamon buns look so yummy! Thanks for sharing this recipe at C&C with J&J. Enjoy the week. Oh, my, how sinful!!! Never heard of cinnamon rolls being baked in a cast iron skillet. We went to the Dallas Arboretum last fall when the pumpkins and mums were in full array. And, I'm with your Granddaughter, that is a lovely teacup. Happy new week! Hi Kitty! I've so missed visiting you! I'm home now, and hopefully can catch up. Oh my, those cinnamon rolls look fabulous! I like cooking in my cast iron, but never thought of doing cinnamon rolls in it. You're right, they certainly would make a nice Easter treat. 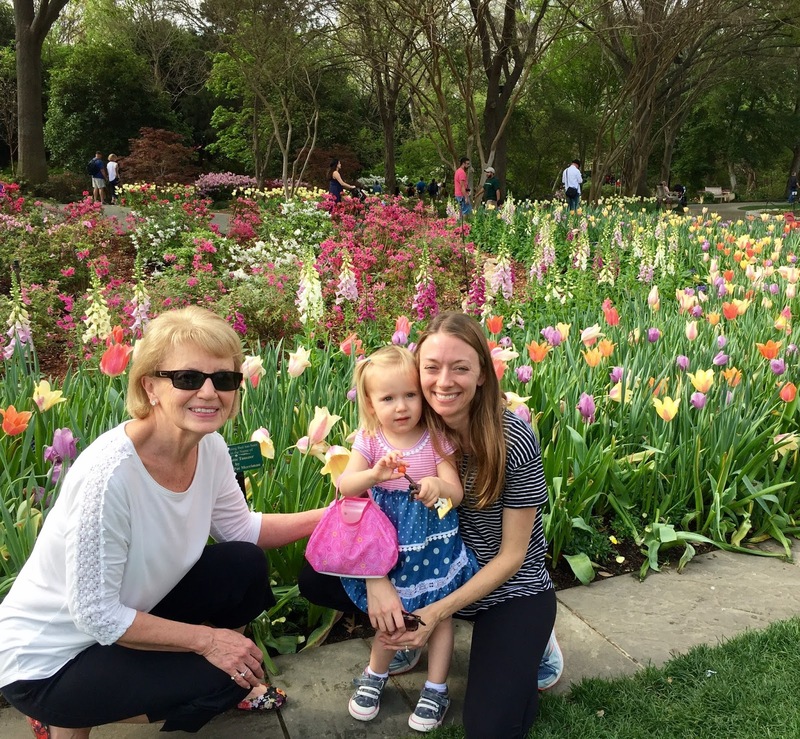 Love seeing your pretty smile and your family, and those lovely spring flowers. Such a gorgeous post filled with oh-so-pretty china, sweet bunnies, gorgeous Dallas blooms, delicious cinnamon rolls.....all beautiful. How wonderful for your Connor to have his new car. How proud you must have been going for a "spin" with him. Gorgeous photo of you amongst all those beautiful blooms, Kitty. I just had a little slice of store bought cinnamon coffee cake, Kitty! We're on the same wavelength. 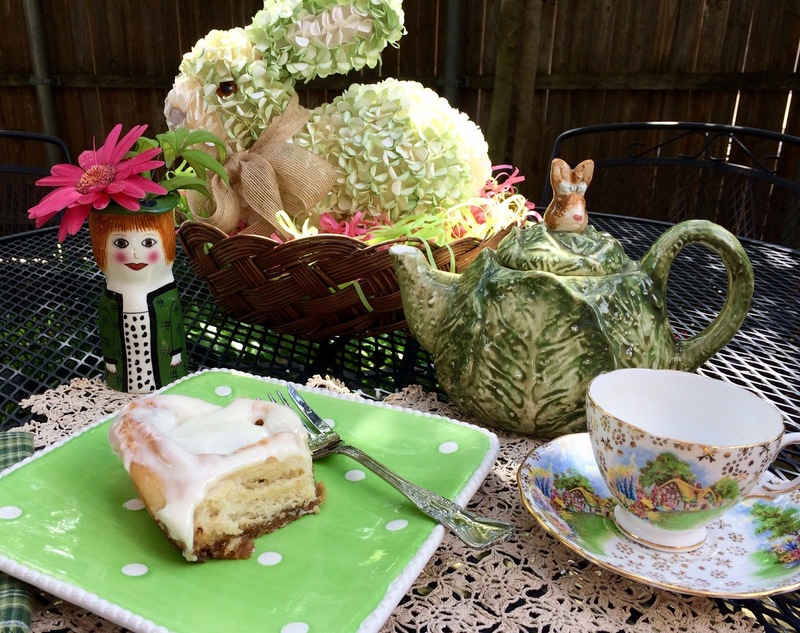 Love your darling bunny, that precious teapot & all the other beautiful accouterments! BRAVO! Your bunny teapot and floral arrangement are adorable, Kitty! What a pretty shot at the Dallas blooms. The temperatures here are still too cold for flowers. How exciting for your grandson to have his own wheels now. Oh, the freedom! 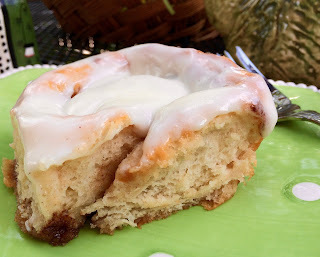 Now I'm craving cinnamon rolls with cream cheese! Oh my . . . these amazing! I think I kill the yeast every time so I'm not very good at baking things that have to rise haha! What lovely pics of you and your family -- looks like you had beautiful weather and a beautiful time! I still remember the excitement of MY first car . . . to be young again! Oh those look so amazing. I also love that cute teacup. Your kids and grandkids are so wonderful-I love hearing all about them. You are a lucky lady, dear Kitty! You make the best treats/foods! I am so hungry for one of those rolls! That is a pretty teacup :) You are blessed with your family. I'd love to go to Dallas Blooms again. It is a favorite spring outing! I wanted to stop by to tell you how much I appreciate your prayers for my surgery last Monday. Diana posted a prayer request on her blog and I am full of gratitude! I am slowly recovering but wanted you to know how very much I appreciate you thinking of me. :-) I love your blog and look forward to following along and getting to know you better. Have a great week! So much wonderful colour in this post. It's truly getting to be springtime! How tall your grandson is! 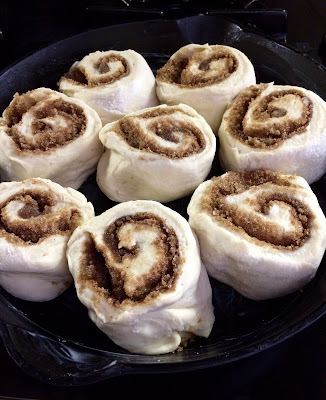 The cinnamon buns look delicious - what a great idea to combine baking powder and yeast for speed. Oh Kitty- how lovely spending time with your loving and beautiful family! I can't believe how tall Conner is - he is towering over your petite frame! I am so happy about his new car, he must be on cloud nine! My grandma, you look so petite beside your grandson. lol That's me too with our 6.2" grandson. 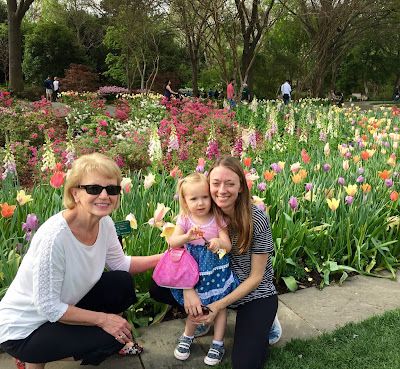 The arboretum display of tulips and lupines behind you is spectacular. The cottage teacup is a sweet one, perfect for a cup of tea and decadent home baked cinnamon bun. Dearest Kitty, those cinnamon rolls look delicious! Cinnamon rolls are my all time favorite!! You are so beautiful in those photos. 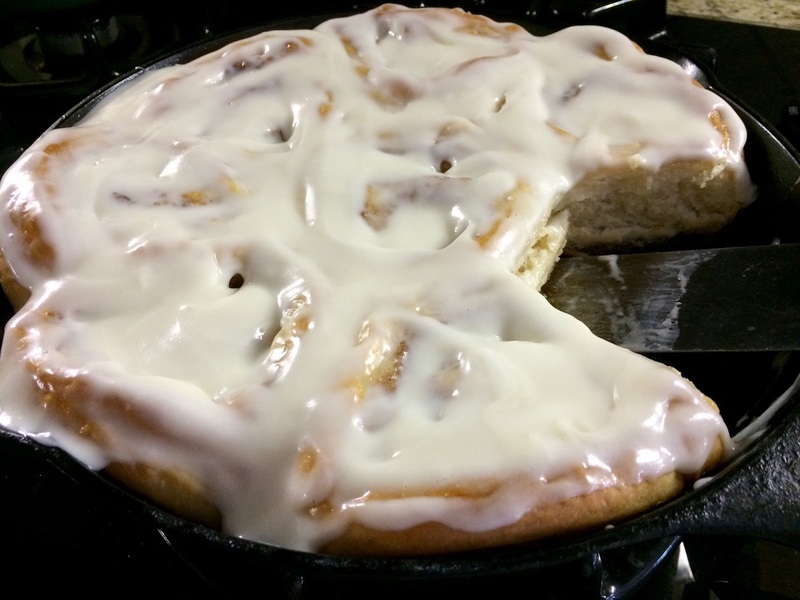 Love using my cast iron pans and Cinnamon Rolls are going to be perfect for a Spring brunch! Oh Kitty...you are killing me with all of these wonderful goodies that you bake! If I baked like you do, I wouldn't be able to fit through the door because I would be eating it! Those cinnamon rolls look DIVINE! You always set up such a beautiful table with all of your gorgeous teacups and other lovelies. Thanks for sharing the recipe and enjoy the rest of your week! Kitty, I was at the Arboretum, Tuesday, March 28th! We took our granddaughter that morning. I haven't posted it about it yet. Still getting back to normal after our trip. Your cinnamon rolls look so yummy! I adore the rabbit and teapot. The entire vignette is charming. OH MY....those look amazing. I could taste them in my mouth now! Thanks for sharing. There is always a yummy party going on at your place. And cinnamon buns make the house smell amazing. Kitty, I love that your grandson took you for a ride in his "new" car! Sweet! And those cinnamon rolls - I've never made any in a hurry, but when I do, this will be the one! The cottage tea cup is so beautiful.. I'll take your word that these are delicious as they look! I'm definitely trying this one. Getting a new car is always so exciting, especially when you're young! Glad Connor drove nice and carefully for his grandma ;) Enjoy your weekend. The cinnamon rolls look delicious! I can almost smell them. What a wonderful treat to have your grandson chauffeur you. Love this post! I bet those cinnamon buns didn't last long. It looks like you picked a wonderful day to visit the Arboretum…the blooms are lovely. What a great photo! You looks so cute and these cinnamon buns are wonderful in the good ole cast iron frying pan! Thanks for sharing Kitty. Kitty, I love the cute teacup and that darling tea pot! The cinnamon buns look so yummy. I have a cast iron skillet and want to try them. I have two grands that just started driving, and three that already did. Boy, am I getting old? lol! Thanks for sharing with SYC. Kitty, I'm back for another visit. I would love one of those cinnamon rolls now! Your Cinnamon Buns are wonderful and I love the idea of the iron skillet. Wishing you and your family a very special Easter season and thanks so much for sharing with us at Full Plate Thursday. Those rolls look really good right now with my coffee. Your cottage tea cup is beautiful and the Dallas Arboretum? Oh Wow! Another wonderful looking recipe, Kitty! I've pinned this one too. 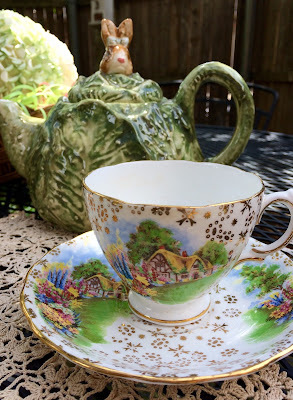 Your outdoor table looks so pretty, and that cottage teacup is a favorite of mine, too. :) I remember it from a previous post, and it's oh so pretty. Thanks for sharing this yummy recipe, Kitty, and Happy Easter to you, my friend.